Stakes Markers Plant Labels Nursery Tags 4'' X 5/8'' (4000) by MJ_Sehilfarm at Tulips Orchids. Hurry! Limited time offer. Offer valid only while supplies last. 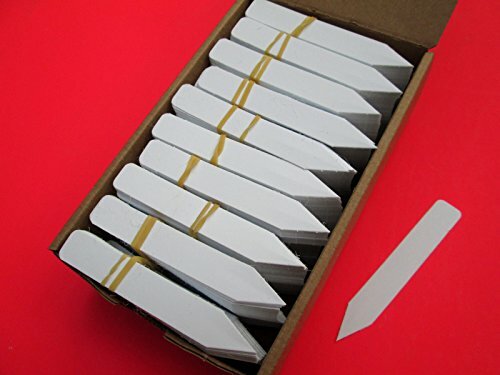 White plastic plant stakes - 4" X 5/8"
Made in the USA from sturdy recycled plastic. Can be imprinted with pencil, permanent paint markers, or felt pens. These are the plant tags we use in our nursery. Great for labeling seedlings trays, cuttings and 2" to 10 gallon pots. If you have any questions about this product by MJ_Sehilfarm, contact us by completing and submitting the form below. If you are looking for a specif part number, please include it with your message. 3000 Yellow Plastic Plant Stakes Labels Nursery Tags - Made in USA 4" X 5/8"